These are the two colourways I have together. They are both Fleece Artist (love that stuff). The blue is Silk Stream (half silk half wool) in Mermaid, and the other is Ottawa (wool with just a bit of viscose) in Dragonfly. The colours are similar-just in different proportions. So they work. Right? They do. I think. 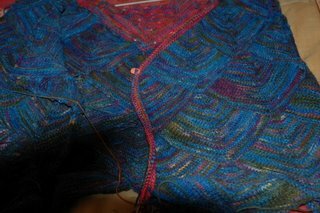 I am a little further ahead now-the shawl collar is done, and everything is edged in the blue. Now for the sleeves. I have a ton of Ottawa left-not much of the Silk Stream-so the sleeves will be pinky by default. I just hope this doesn't look like a clown suit when I am done. I am thinking of doing little triangles in blue around the cuff(oh- I forgot- I also have little diamonds in the pink at the junction of the blue diamonds at the bottom hem-they are about half the size of the blue ones). Any suggestions? Oh- before I forget- please wear sunscreen if you are anywhere near here- the UV index is 9 or very high. Holy cow! Edit- I forgot to add- for those who know me-I have been in and out of the hospital this week- doc thought I have a blood clot (I had a total knee replacement done in March). The emerg doctor was someone I knew- he said he was willing to bet $$ that it was a clot, and was surprised when none was found. He also said my knee looks weird. Must be some new doctor talk. I have to keep it elevated until I see my surgeon.